Sometimes you just have to love it when the universe throws you a bone every now and again. 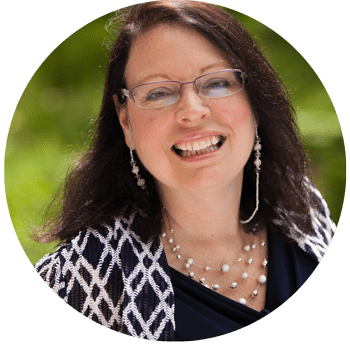 On a recent traveling adventure, exploring upstate New York, I discovered four really great reasons why trusting the Universe is an awesome thing. After traveling to Niagara Falls and the Labrador Hollow Unique Area (Yes, that’s what it is called) on Saturday, it was decided that we would travel to Watkins Glen State Park on Sunday and then head home afterwards. As we were traveling along, I noted what a beautiful day it was, with bright sunshine and little puffy clouds to dot the sky which is good for photography. The temperature was in the low 80’s, with low humidity. I’d say a pretty perfect day for site seeing. Reason #1: Never underestimate the potential of where dirt roads can take you. We were traveling along per the GPS instructions, through small communities. The GPS took us on a dirt road. I was a little concerned because of past history in my wanderings around the United States. Due to having been on some GPS guided dirt roads in the past that required 4 wheel drive in my truck, I was concerned if the current vehicle was ok to take on this road. I had to laugh because it reminded me that on some of those past dirt road recommendations, I think I heard the banjo music from the movie Deliverance, but that is blog for another day. With a little trepidation, we continued traveling along the recommended GPS route. Was I ever glad that we did. We crested a hill, and the entire landscape opened up along a side of a vineyard to view Seneca Lake. It was gorgeous. Conveniently, there was even a pull over on the road to take pictures. 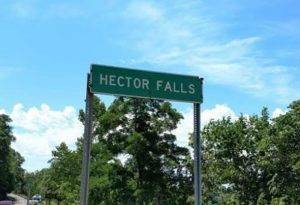 As we drove along traveling through upstate New York, we came upon the beautiful waterfall of Hector Falls on Route 414 in Burdett New York on the side of the road. There was not much of a pull over as there were a lot of cars already pulled over but we managed to fit our car in. The people in front of us, also from Connecticut, saw that our car was sticking out into the road a little bit, and moved their vehicle forward just enough so that we were no longer sticking out in the road. Which was really nice. The upper part of the falls can be seen from the highway. The bridge to the road goes over the waterfall in the middle of the falls. You can see a limited part of the lower waterfall on the other side of the street. Best viewing of the entire waterfall would be from Seneca Lake. 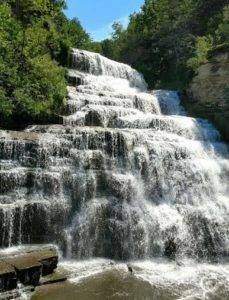 Unfortunately, the only way to get to the lower part of the falls is through private property or kayaking in from Seneca Lake. 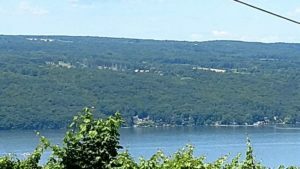 The private property called the Finger Lakes Waterfall Resort appears to be a traditional New York rustic resort type of establishment with little cabins and a really great view of the lake. I almost hate to give them free marketing, because they are kind of douchey about prohibiting people from see the lower falls. They had a multitude of signs and barriers to prevent people from parking or going down the path to the lower falls. Honestly, they could monetize that location with picnic tables, access to the lower falls and a conveniently located gift and snack shop, just saying. We did see people in kayaks come into the inlet from an area on Seneca Lake called Hector Falls Point to stop and take pictures. The upper falls were very beautiful and outstanding and photo worthy. As I looked around and found two informational plaque type road signs that looked quite old. The first plaque commemorated a woolen mill that was erected there in 1801. The first woolen mill to be established in that county. I’m sure that there is a joke in that, but it escapes me now. 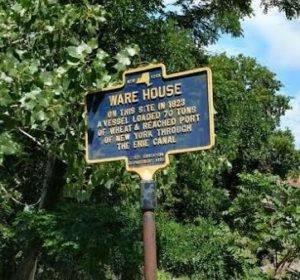 The second sign informed the traveler that there was a warehouse the sign reads that in 1823 a vessel loaded up 70 tons of wheat made its way to the port of New York through the Erie Canal. I thought, “Ok, big whoop.” I’m from Connecticut. I totally understand how it is when you come from a place that has no real claim to fame. Connecticut is a place that will make seemingly small things look like a big deal. I looked up when the Erie Canal was built, and the date of completion was 1825. HMMMM so that boat loaded with 70 tons of grain went through the canal prior to it being completed. I’m sure that there is more to the story, but I couldn’t readily find anything. I’ll leave it as an unsolved mystery and something to ponder in the future. At this point in the traveling adventure of upstate New York, I was feeling a wonderful warm gratitude welling up inside of me to the GPS Angel, Divine Providence, The Great Spirit, Allah or God, which ever you prefer. I was moved to say a prayer of thanks for our experience so far. Driving on down the road a bit, we decided that a bio-break was in order. Additionally, the car would be in need of gas soon. We decided to make it a twofer pit stop. It had been a while since we had seen anything other than stunning pastoral views of farms, forests, mountains and an occasional view of a finger lake. I stopped at the first gas station we happened upon in Burdett New York. I moved the car away from gas pumps after gassing up and parked the car at the edge of the parking lot. With a few minutes to spare while I was waiting for John to come back out of the convenience store, I decided to take in my surroundings. As I was perusing the area, there was a little horse farm next to the service station. The farm had a lot of signs along the property line that warned people not to attempt to feed the horses. The signs also indicated that the electric fence was live. I thought that was interesting. There were a great many of the signs posted along the fence line. I got the feeling that in the past, there might have been some definite Darwin award winners that have fed the horses. Figuring there were probably a funny story or two in there somewhere, I deciding to knock on the door and ask the owners of the horse farm about the signage. Then about a half of second later, I got myself sidetracked and I went all Dory about life (Watch the movie, “Finding Nemo” to understand the reference.) My attention was turned to across the street. 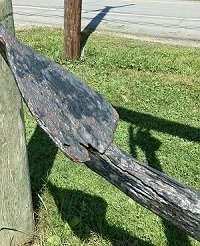 A few feet from the road, there was a giant anchor suspended by three pressure treated logs about the width(ish) of a telephone pole . What did I do? I marched right on over across that street to see if there were any plaques, stones or signs explaining the anchor. There was no plaque, and while we stood there contemplating the suspended anchor, I noticed an older gentleman sitting in a chair facing away from us, seemingly enjoying a morning respite. I went right on over to talk to him to find out what the deal was about the anchor. I said “Excuse me.” with a big smile. I asked the man if he knew anything about the anchor. He grinned a big boyish grin, and his blue eyes twinkled. His emphatic response was, “Yes that is my anchor, I put it there.” I figured that perhaps he was a Navy man but when I asked him, he said no. He responded by telling me that he used to own a barge and a crane and made a living dredging Long Island Sound and some of the rivers along Connecticut and New York. He pulled up the anchor in one of his dredging expeditions. It was clear that he was pretty proud of his anchor. His name is Chris. I asked him a barrage of questions about dredging and some of the other items he pulled out of the sound. This is where his wife, June, joined us in the conversation. As it turns out his wife, was from Connecticut. They lived and raised their children in Connecticut. After retirement, they spend the summers in his boyhood home in upstate New York and then traveling to Florida to snowbird for the winter. June was a little reserved at first. She was probably wondering what these strangers were doing in their yard talking to her husband. She warmed up to us quickly. Everyone has great stories to tell and Chris was no exception. “What was one of the weirdest things you ever pulled out of the water?”, I asked Chris. He said that he was outside of New Rochelle on a dredging job. He told us a story about how boat owners kept hitting a rock on the bottom of a river. The river was supposed to be deep enough so that boats could navigate on it. He was commissions to dredge the river. He indicated that he pulled a very large safe out of the water. I was excited to hear if the safe contained anything. Sadly, he said it didn’t have anything in it. He told us that someone robbed the safe from a building, emptied the contents, and threw it in the river. I had to ponder that for a bit. Safes weigh a ton. How does one go about getting it out of a building and throw it into a river undetected? I guess that is a question that will go unanswered for now. In addition, Chris was also a commercial lobsterman that had anywhere from 200-300 lobster pots he maintained yearly. I asked if there was any money in that? Both he and his wife emphatically exclaimed as if to say “DUH!” but were too polite, so they simply said “Yes!” Surprised, I said to them that I have talked to a few lobster guys over the years and they said it doesn’t pay. They looked at each other, and they both said, “Margaret, don’t you know that fishermen lie?” We all laughed. Then she said, they don’t want you to know that because they don’t want too many people doing it. This was a bit of a revelation to me. After thinking on it more, I realized that there was that old fisherman tradition called, I-caught-a-fish-this-big. Maybe the whole lying thing was just part of the fishermen’s culture. I asked if they would be ok with me taking a picture for the blog. Chris informed me that I can take as many pictures as I wanted. A bit camera shy, June passed. So that is me in the picture with Chris. As we walked over to the Anchor, he had several plots of land that he had set up as a garden. I noted how impressively organized and his garden and how impeccably straight his rows were. When asked, June admitted that she had nothing to do with the garden. From her reactions, it was clear that gardening was not her thing. It appeared as if Chris might have had a stroke in the recent past that caused slurring speech and just a touch of mobility loss which was not evident until he got up to walk. I imagined, it would be hard for him to maintain the garden so beautifully all by himself. That made me all the more impressed with Chris. He was my daily reminder of the, no excuses, life lesson. I could tell that he was not one for sitting still for too long and needed to stay busy. He agreed that he was indeed that type of person. Gardening is, after all, a great productive hobby to have. I assumed that the garden plants were all vegetables because of the way the gardens were laid out. As it turned out he also grew flowers in the garden. He had sunflowers and was particularly partial to his gladiolas. He enjoyed clipping and bringing them into the house to enjoy. According to Chris, after cutting gladiolas from the garden, they lasted several weeks. He has a farm stand set up right next to the anchor and puts out vegetables for sale. This farm stand is an on-your-honor stand where they put out a tin can, and people pay as they pick up the vegetables. They said that 90% of the time, people pay for what they take. The couple was impressed and happy that there were so many good people out there. But still, I had to wonder about the other 10%. [/media-credit] The part of the anchor most effected by electrolysis. We walked over to the anchor, and he informed us that it weighed 640 lbs. The anchor traveled from the east coast, and was transported to its current location via a boat trailer. He talked about the effects of water on metal. He indicated that if metal sits in the water too long, electrolysis occurs and eats the metal. The metal will stay fairly in tact with little degradation when completely covered with silt and dirt. The anchor looked to be in great shape except for the side in the picture. He said with pride that many people have stopped and have taken pictures with the anchor. Multiple people have even offered to purchase the anchor as well, but I think that will be a very tough sell. I got the feeling that he is going to hang onto it forever. I really wanted to hang around to get to know Chris and June a little more on this beautiful day. Unfortunately, I had to be the one to say, “Well we are on our way traveling to Watkins Glen. 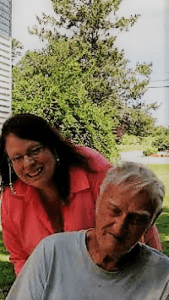 Thank you so much for sharing.” We said our goodbyes and June even invited us to drop back in next year if we go back to upstate New York again. I accepted her invitation and warned her that I’m the kind of person that actually does show up. She smiled and said, “I hope you do!” How awesome is that? I learned a little about the dredging business, the degradation of metal in water, being a lobsterman, clams, gardening, human persistent and best of all human goodwill due to this one short and enjoyable conversation. Welcome new experiences. Don’t be afraid to let the universe steer for a while and maybe, just maybe, the universe has something that it needs you to be a part of. Something better or bigger than yourself. 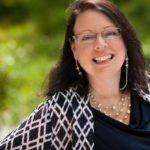 What happens when an upbeat, sociable, single, empty nester in midlife, outdoor enthusiast, critter gal, science geek, history buff, treasure hunter with an addiction to brown signs and the wanderlust, embarks on a 4 month road trip in her Chevy pickup truck, loaded with a tent, kayak, bicycle, 5 changes of clothes, her laptop, and cell phone, by herself, that essentially turned into a fulltime lifestyle? Thank you, I am so glad that I was able to help! Thank you so much! What a great day. Excellent rood trip and I got to meet some new and wonderful people!